Trees are the most essential bounties of Nature contributing to the sustenance of life on earth. To industrialised countries trees are a treasure trove of biodiversity and green house gas sinks that not only absorb carbon dioxide and thus keep global warming in check but also release oxygen to keep people hale and hearty. To the developing nations these trees, so to say, the forests are resources ripe for exploitation: a potential farmland, a free source of fuel and a store house of such kinds of woods that command high prices in the markets. And these forests and plantations must be continued to maintain ecological balance of the planet earth. Without any contradiction, the world needs a lot of them to store the carbon produced by the growing population that triumphs on industrialisation. The need calls for preserving the forests that are still there after massive logging by human beings and restoring those that have been destroyed. Unsurprisingly, in Bangladesh trees are being felled for fuel in the households and brick fields and also to meet the growing need of croplands for feeding the burgeoning population. But other than this type of extinction, there is another deadly culprit at work that is slowly denuding the forests of the Sunderbans, Cox's Bazar, Sylhet and in northern parts of Bangladesh much beyond our knowledge. The disease called "the dying forest syndrome" which in the Sunderbans is known as "top dying disease" strikes selectively but with deadly effect. The onset of the disease starts with the dark green branches hanging limply. Between five weeks and three years later, the branches are tinged yellow and then brown. The weakened tree soon drops its needles and eventually stops growing new ones. It becomes leafless at the top and appears stunted. Finally drought, insects, and parasites finish off the weakened plant. In parts of Africa, Europe and most notably in the Sunderbans in Bangladesh, the dying forest syndrome causing death of trees has come up as a big environmental disaster. 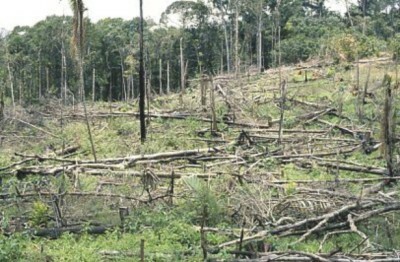 The epidemic of dying trees which has struck the forest resources of the world appears to be quite mysterious. But the most convincing evidence points to air pollution, specially sulfur dioxide and oxides of nitrogen spewed in the air by the ton from electrical generating stations, industrial boilers, smelting plants and automobiles located thousands of miles away. One school of thought points out, by itself sulfur dioxide can sap the vitality of the tree;.so can oxides of nitrogen. But the real problem seems to begin when two gases work in combination in the atmosphere. Hurled into the air by tall smokestacks, the substances mix with water vapour to form sulfuric acid and nitric acid known as acid rain and in the presence of sunlight turn into oxidants such as ozone. When these new chemical mixtures fall to earth as snow or rain or float into forests as wind or fog, they can be far more lethal than the ingredients that went into them. Acid rain, in the form of dry particles, snow and fog, attacks a tree on all fronts. Airborne pollution settles first on the highest treetops of the forest crown, which acts as a natural windbreak. Acid precipitation filters down to the soil, eats away at the root system and eventually leaches out key nutrients such as calcium and potassium and mobilises toxic metals like aluminum. Once on a leaf or needle, acid rain disrupts the operation of the stomata, the tiny openings that permit a tree to "breathe." The process of photosynthesis is thrown off balance, and subtle changes take place in the internal chemistry of the tree that result in discolouration and premature aging. Finally acid rain washes away vital nutrients from the leaves and needles so that the tree slowly starves to death, its respiratory, circulatory and digestive systems being crippled. Much like an AIDS victim whose immune system has broken down, the ailing tree is defenceless against the ravages of nature. Experts now say that precipitation these days has become more acidic since the onset of the industrial revolution in the mid 19th century. Measured on a chemical scale of pH from 0 to 14 (most acidic to most alkaline), acid rain is defined as precipitation below 5.6. In most of the industrialised countries of Europe, rainfall now has a pH between 4.5 and 5.5. In some parts of Italy, it has been recorded as low as 2.6 or acidic than table vinegar, which has a pH of about 2.9. What makes tracking down the cause of toxic poisoning so frustratingly difficult is the caprice of the wind. Modern smokestacks rising more than 1200ft, may spare the surrounding countryside. But they can emit pollutants high into the air, where they travel along wind-formed "skyways" that can carry them hundreds of miles even beyond the country that produced them. That answers the dilemma of the non-industrialised countries like Bangladesh who are not sinners but have to pay a heavy price for other's faults. ... The dying forest has had a greater importance to the Germans than any other issue. They look at forests as being more important than their own health That leads us to think how much oblivious and unconcerned we are about the depletion of our forest resources through factors like dying forest syndrome or top dying disease in the Sunderbans other than rampant logging by interest groups. Any country for its ecological balance needs at least 25 percent forest cover. But in our country at the moment pollution hazard coupled with human assault, and outright theft have brought forest cover down to almost 7 per cent. Reports have it that in August last a huge consignment of wood worth Tk.18 lakh was seized from the Sunderbans territory while these were being pilfered by unscrupulous groups in collusion with the forest officials. Reports have it that existence of Sitakunda mangrove forest is at stake as a syndicate of land grabbers has been felling a large number of growing trees for establishing a ship-breaking yard. Because of human greed and insensible activities, we are losing the emerald forest resources the showcase for the diversity of life either in the Sunderbans, Chittagong hill tracts or Sylhet. Sheer management problem and inadequate attention in protecting forest wealth are largely to blame for the decimation of the Sunderbans. The author during his last visit to the Sunderbans while passing through the different forest nranges found to his utter surprise that Harintana camp under Sharankhola Range covering about 200 to 300 crore taka worth of forest resources is protected by only 3 to 5 forest guards with no modern arms and mechanised boats to challenge and run after the organised gangs. More shockingly, their pay is unbelievably low to draw them to their professional duties. On the other hand, battered by cyclone, tidal surge and most importantly because of lack of management, the present area of the Sunderbans in the Bangladesh territory has shrunk to five thousand seven hundred sq km from its previous ten thousand six hundred sqkm hundred years ago. In recent years, other than the impact of Farakka barrage, indiscriminate poaching, shrimp cultivation and hatchery in the entire coastal belt of the Sunderbans have caused serious ecological damage. Moreover explosive growth of population in the country and loss of livelihood in the densely packed ancestral villages has forced people to move to new locations for a better life and living and consequently this has caused more forest land to be cleared with consequent loss of many species of plants and animals. Consequently, potentially valuable food and medicinal sources hidden in these areas are being lost forever before they are even discovered. Shockingly, spurred by poverty, population growth and wrong policy decisions of government and simple greed, humans around the globe, especially in Bangladesh are at war with the plants and animals that share the region. The present blight and lamentable depletion of forest resources account for the drought and climatic variations experienced in the country. Shockingly, because of lax governance, the city planners and agencies concerned in their bid to build houses and construct roads have perhaps forgotten the age old adage ,"The city was seen as something made by man and the forest as something made by God." Precisely speaking, lack of environmental awareness in the country has significantly contributed to the extinction of trees bringing in its wake unusual flooding, inundation of coastal belts and severe crop losses due to inadequate rainfall. On the other hand spectre of devastated woodland triggers a spate of illnesses like respiratory tract infections, malignant tumours and congenital deformities of babies. Experts have cautioned against a move in the offing to conduct seismic survey for oil and gas exploration in the Sunderbans covering over 1000 km area that are likely to pose dangerous threat to forest wealth as well as biodiversity in the adjoining area. The penetrating ray shot over the sky that can easily penetrate 5-6 km down the earth surface may cause severe damage to bio-diversity other than the fact that it can affect humans through spreading severe diseases like tumours, cancers and cataract. Interestingly, climate and rainfall make certain areas better suited than others to the creation and maintenance of large standing stores of carbon. It is only logical that the countries that control actual or potential forest areas will begin to demand rent in one form or another for the service they provide to the rest of the world. But it is equally true whether it is Brazilian, Philippine, African, Indonesian or Bangladesh forests, we must concede that the people actually carrying out the destruction are obeying the first rule of any living being: to survive. Political problems, drought, salinity and river erosion often contribute to the destruction of forests as it has been in Chittagong region by the heavy influx of Rohingyas from Myanmar. To preserve an environment, whether it is wetland or forest in any part of the world, more so in Bangladesh, there must be an acceptable and rising level of economic well-being for the humans who live in and around it. Environmentalism requires restraint. Poor people who lack food to eat or fuel to burn lack restraint as well. The slaughter of the elephants should teach us a lesson relevant to trees. Precisely true, without some economic surplus in human society, there will never be meaningful conservation. Speaking about Bangladesh or the world at large, if we need to protect the remaining forests, a crash effort must be made to provide alternative livelihood to the people living in and around them. Md Asadullah Khan is a former teacher of physics and Controller of Examinations, BUET.